Auggie: You’ve had this rocking chair for quite some time now. A very close friend took the time to stain it and make it shine extra. When she gifted it to me you were still growing in my belly at 30 weeks. 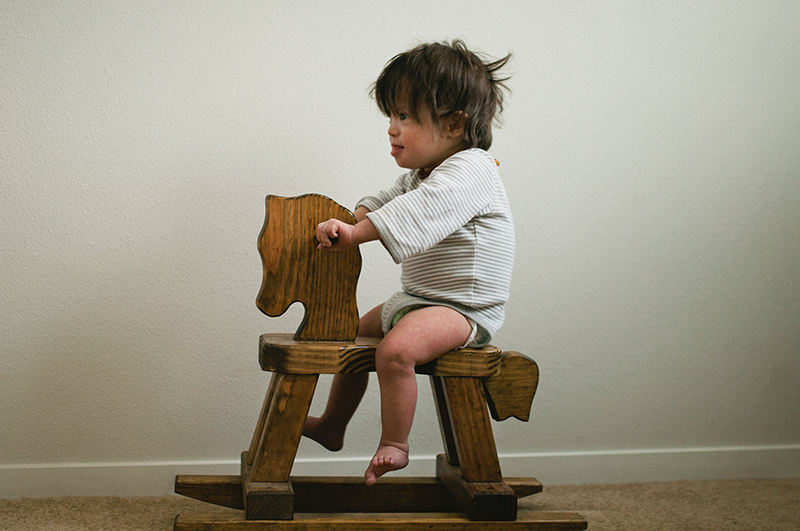 It’s been sitting in your nursery making a pretty little decor piece and until this week, you had never ridden it. Most toddlers your age would have started playing with it much sooner. But I suppose I waited so long because I wasn’t sure you’d understand or be able to sway back and forth on your own. Well, it turns out I’ve underestimated you completely. 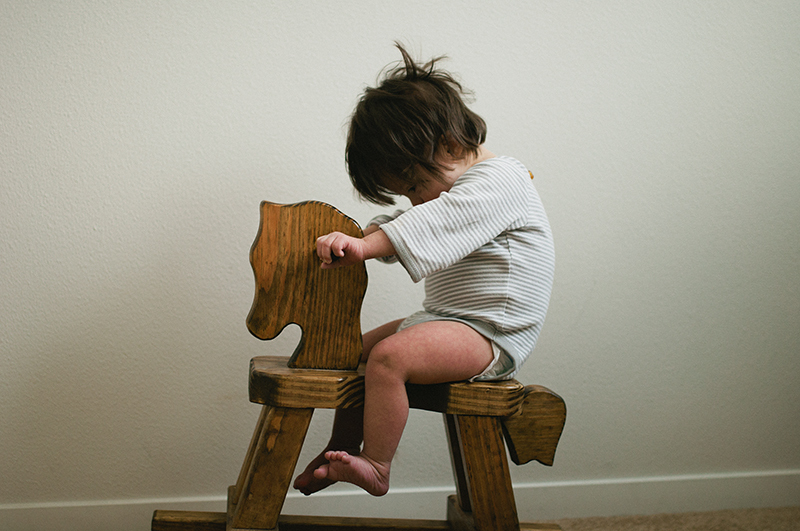 I picked you up from your crib post nap, tried and failed to smooth your bedhead and the tufts of hair that stick out from the back of your head (in the same exact spot that your father gets them after he sleeps) and set you on the horse. Right away you grabbed the handles and began to lean backwards. The mama bear in me instinctively reacted and I stuck my hand out behind you. But you didn’t fall. Your big toes began to curl downward, much like they always do when you are focused on something, and you leaned to and fro. With each lean came giggles and squeals of excitement that grew louder and louder. I smiled, let go and stopped reaching out behind you. I suppose I’ll have to get used to doing that. Hannah Grace Kessie - your posts always bring me happy tears. Love seeing photos of your little boy. Caitlin Snyder - So beautifully written! Dorothy Hynes - I am so amazed,but you know God will take care. Penny Swanson - <3 love following Auggie's journey in life. I love how his big toe curls under. You are doing such a wonderful job raising him mom...keep it up. sybianna - he’s so beautiful. 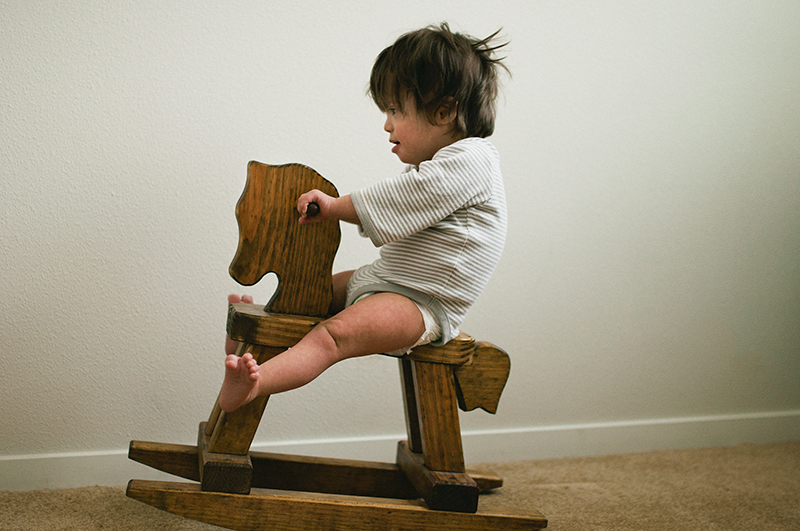 Victoria / Justice Pirate - What a cool rocking horse. He is so cute on it too!! !